Philosophy | AMI Investment Management, Inc. Step 1: Determine the right long-term asset allocation given the investor’s unique needs and objectives. “Asset allocation” is a fancy way of saying how much an investor should target in safer investments, like bonds, versus riskier investments, like stocks. The goal is to select a long-term allocation. 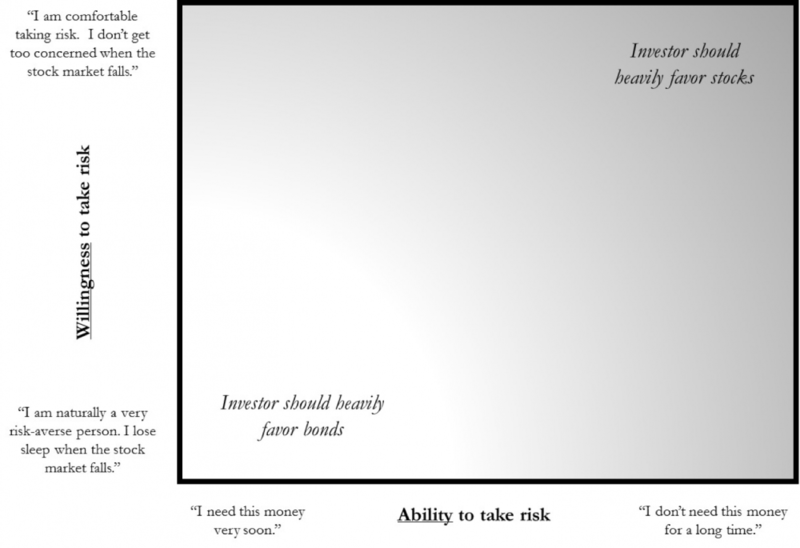 The best answer depends on the investor’s unique circumstances, specifically his or her ability to take risk and his or her willingness to take risk (see illustration below). The important point is to devise a plan that (a) is appropriate given the intended use of the investment assets and (b) the investor can stick to through the inevitable ups and downs of investing. Step 2: Implement the decision made during Step 1 by building an investment portfolio. Once a decision is made in Step 1, it must be implemented. The starting point is a low-cost, well-diversified portfolio consisting of stocks and bonds. Because investments markets have grown increasingly efficient, it is difficult to do much better than this starting point, at least without taking more risk. Warren Buffett cites the great baseball player Ted Williams, who maximized his batting average by only swinging at pitches in his “sweet zone.” Buffett points out that investors have a leg-up on batters because there are no called strike-outs in investing. Investors can patiently wait at the plate for the “fat pitch.” In other words, stick to the low-cost, well-diversified portfolio and deviate if and only if attractive opportunities arise. Each avenue has its pitfalls, and should be approached with caution, patience and a disciplined approach to independent, fundamental research. They don’t let short-term noise distract them from long-term strategy. They focus on things they can control, including a robust investment process grounded in in-depth, fundamental research. They run efficient portfolios and avoid paying excessive fees or drifting into and out of different investment strategies or styles. They focus on risk first and return second. AMI helps clients both determine the optimal long-term asset allocation targets given their circumstances and then implement this decision effectively and efficiently in the client’s investment portfolio. We invest alongside our clients, try to set a high hurdle for investment activities, focus on disciplined expense management and support all decisions with in-depth, independent research.